Lemon thyme chicken is full of flavor and the chicken turns out tender and moist, it can be served with pasta or rice. I like this time of year. Everything is coming back to life and we have color back. Winter, it is beautiful when there is a snowfall and everything is white and crisp, but I always long for the beautiful bold colors of summer. We have our garden planted. And I have my fingers crossed that the rabbits don’t eat everything in the garden as they have been trying to do the past two summers. With the garden planted that means there are fresh herbs. Even though the plant is small I took a small amount of thyme for this dish. It has only been the past few years that I have been planting herbs. Every year I have good intentions of making lots of recipes to use these herbs and then at the end of the summer, I have fallen short of my intentions. 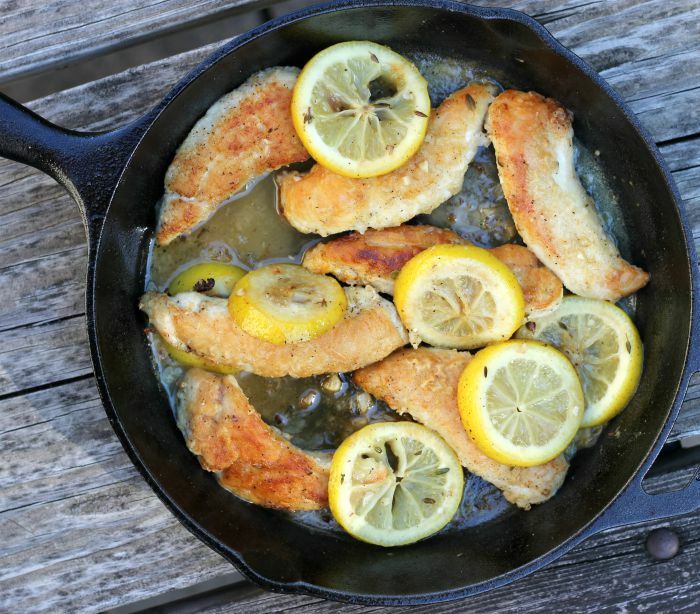 So this year I am getting a jump start with this lemon thyme chicken recipe. I hope I don’t fall short this year. 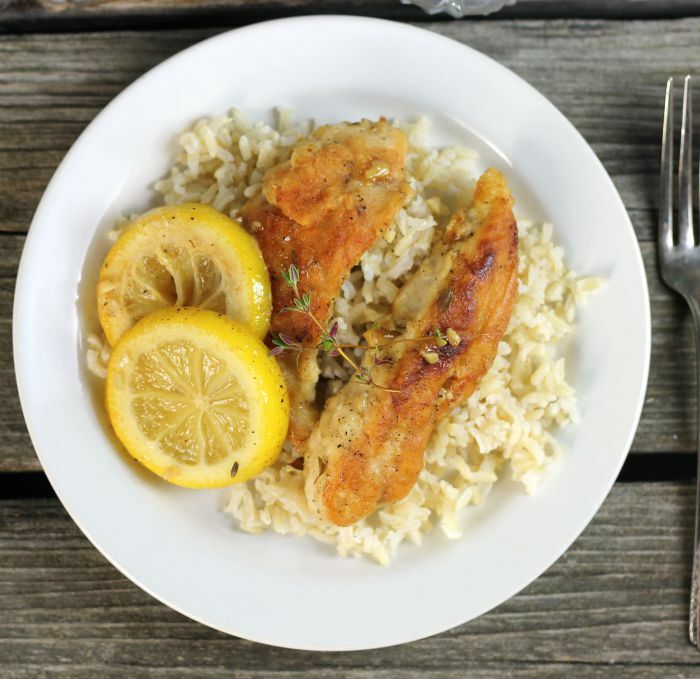 For this lemon thyme chicken, I used chicken tenders which make this recipe perfect for any day of the week. For this recipe, the first thing that you will need to do is brown the chicken, once it is cooked through it is removed from the pan. At this point thyme, garlic, lemon slices, lemon juice, and chicken broth are added to the skillet. It is cooked until it is reduced about one-third to one-half, at this point the chicken is added back into the skillet and simmer for a few minutes. That’s it, the chicken is done and ready to serve with your favorite pasta or rice. 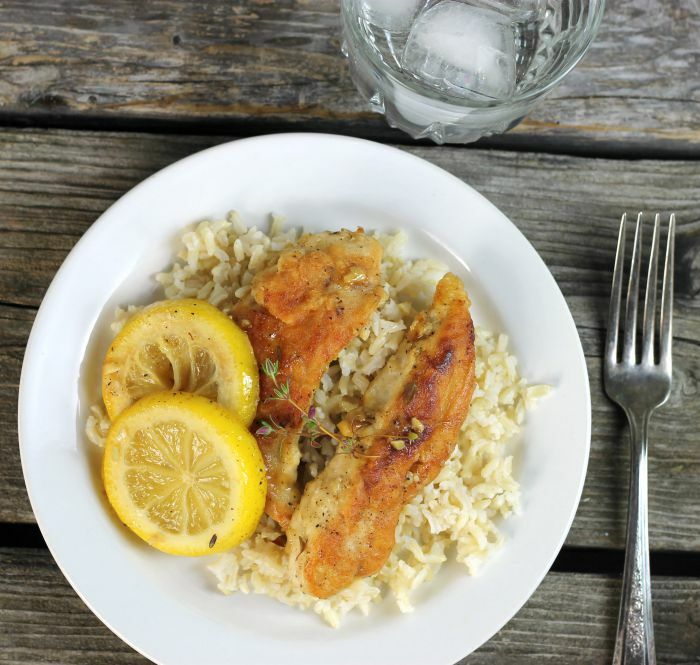 Serve the lemon chicken with a salad or fresh fruit and you are set. Healthy and delicious. 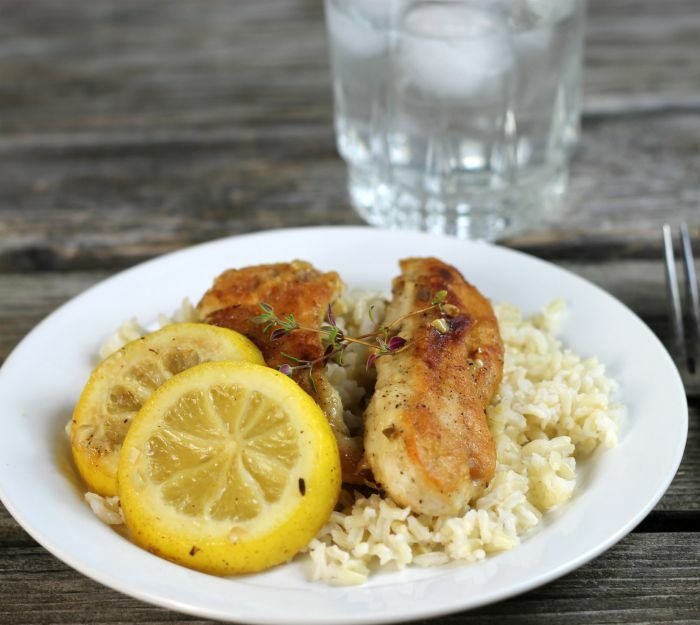 Those chicken tenders are so perfectly prepared…lemon and thyme…a great combo! Lucky you to be able to grow herbs! I can’t get anything but weeds and cacti to grow :). Summer is definitely my favorite time of year too. I love the sun and all the gorgeous produce. This chicken sounds fabulous! Sounds good and looks delicious! Good luck with your garden! Too much shade here now for one, plus rabbits, coyotes and deer, etc. They like to eat a lot! Love thyme! We’re growing some, too. It works so nicely with chicken, doesn’t it? Terrific dish — thanks. Lemon + thyme is such a great summer combination of flavors! Good luck with that herb garden…I totally understand the troubles that come when the rabbits find the garden. Chicken looks perfectly cooked! It’s definitely a no-fail recipe!